We have some very exciting developments for the 2010/2011 season! We can’t wait to launch our newly-updated entertainment system – it really does make travelling to France for your Three Valleys-based ski trip a pleasure! 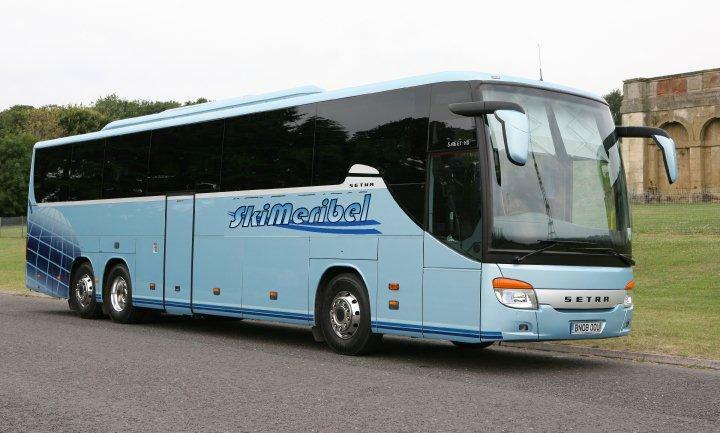 Each year we make sure our coach offers pure luxury at a price that’s right – visit www.skimeribel.co.uk for footage. Two of Méribel’s ski schools are offering new products – ESF is organizing “Le Club E.S.F.” for local and visiting children at weekends and school holidays. 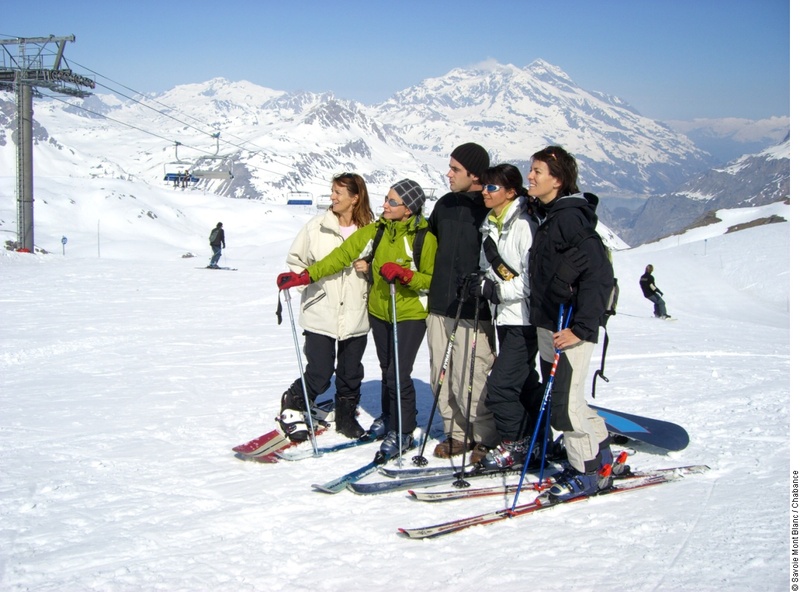 The ESF is also introducing group tuition for those who want to learn off-piste skiing. Snow Systems ski school is introducing “Evasion” adult group lessons designed for those who wish to enjoy skiing in a relaxed manner.﻿ They also have day-long children’s group lessons with lunch, and afternoon group lessons for children and teenagers during French and UK school holidays. Have you heard about The Liberty Pass? Exclusive to Meribel, this is ideal for anyone skiing occasionally that wants to avoid the lift pass office! Each time you ski, the first lift you take registers your day’s skiing – with this ‘pay as you go’ service, the cost is debited directly from your bank account. Discounts on Three Vallées / Méribel Valley lift passes available. What a great idea! Great news – a new, specially-equipped beginners’ piste will shortly open in Meribel’s Altiport area, in the woods. The childrens entertainment piste aims to encourage children to learn about forest animals by guessing the names of the model animals they find along the ski trail. The beginners’ Doron Zen area is also being updated and the slope will be made gentler to make learning to ski more fun. These developments are perfect for families taking a ski holiday in the region! Don’t forget, if you want a green, convenient way to Meribel this winter, http://www.skimeribel.co.uk offers eight days’ skiing on the slopes! Call Tricia on 44 (0)20 8668 8223 for more info. We are sad to report that the Altitude Festival is to quit Méribel after three years, and is moving to Austria. According to our close friends at http://www.merinet.com, the Altitude Festival started in 2008 and brought stars of the comedy world such as Marcus Brigstocke and Phil Jupitas to perform in Méribel. HOWEVER!!! Top level comedy can still be enjoyed in the resort, thanks to Altitude Festival’s organiser Richard Lett’s other company, “Taking the Piste”, which will be running regular comedy events in the region. There are also many wonderful venues offering comedy and live music here. So, don’t mourn the Altitude Festival too much – Meribel’s unique blend of comedy, music and mayhem is still very much present! In addition, the resort continues to sponsor the well-loved music event, The Little World Festival, held in-resort from 12 to 19 March. This event is curated by brilliant UK pop-rock band, The Feeling. If you want to book your ski trip around a specific event, call Tricia on +44 (0)20 8668 8223 for a chat. Email us at info@skimeribel.co.uk or visit www.skimeribel.co.uk for offers and information on our luxury sleeper coach. 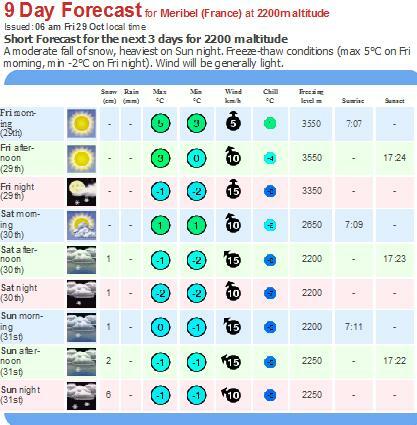 Wow, the forecast is looking great for Meribel – thanks to the fabulous snow-forecast.com for this information – check them out to see what the forecast is like where you are heading! For 2200 m altitude , there’s going to be a moderate fall of snow in Meribel over the next few days. There are freeze-thaw conditions and the wind will be generally light. If you haven’t booked your trip yet, get over to http://www.skimeribel.co.uk for travel and accomodation! It is snowing in Meribel! Good news; the webcam at Chaudanne, Meribel’s central lift station, shows it is snowing at Meribel centre! It is the time for the snow base to start estabilshing itself for the season, as the temperature has dropped. We love this time of year – why not check out the timelapse images at http://www.merinet.com/images-and-videos/meribel-timelapse-webcam-videos.htm to see how much snow the resort is experiencing, and leave a comment on our facebook page facebook.com/skimeribelexpert – tell us all about your experience of Meribel and the surrounding resorts. And when you want to get to Meribel using a green, cost effective method, check out www.skimeribel.co.uk – the world-famous famous sleeper coach!